But I’m telling you, these chips bring me right back to those days. In fact, for the past couple weeks I have simply been eating them straight out of the bag and don’t have enough to bake with. So I finally went out to the store, bought a few more bags, and baked some unbelievable cookies with them. Now to me, to do these chips justice, they had to be baked into something extra chocolatey. I decided to make ultra rich, ultra chocolatey cookies. Most chocolate cookie recipes I find are not nearly chocolatey enough for my tastes. So I came up with one that is so dense, chocolatey, soft on the inside and slightly crispy on the outside that it reminds of a brownie. Thus I have these great chocolate mint brownie cookies. They are everything I look for in a perfect holiday cookie! 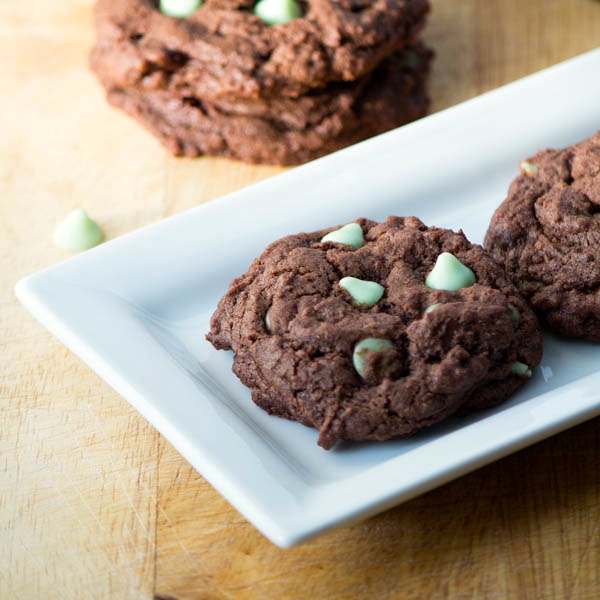 Rich chocolate with the cool and refreshing flavor of mint in an easy to make, simple yet stunning, great tasting cookie! These are exactly the kind of cookies I like to make with my kids! They love helping to mix in the ingredients, crack the eggs and pour in the chips. Snitching a few along the way of course!! In fact, whenever we make chip cookies I like to have an extra bag opened in the kitchen while we are baking to munch on and also to use for decorating the top of each cookie right before baking so that beautiful green, holiday color shows on every cookie! Look, I know you have a lot to do this holiday season with decorating, shopping, cooking, entertaining and the likes. But I’m telling you that you ALSO have time to bake these fabulous cookies. They come together quickly, no need to refrigerate the dough before baking. You will have them ready to enjoy in less than an hour from start to finish!! 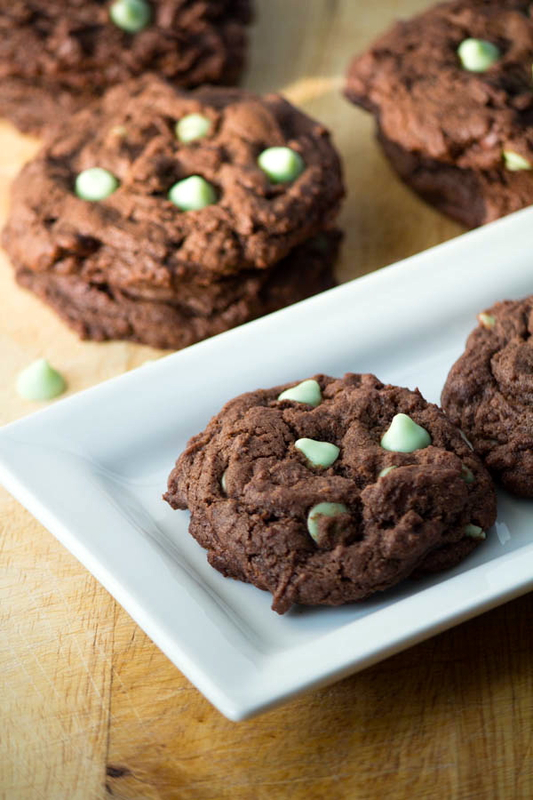 Go grab a bag or two of these delicious mint chips and bake them up into these minty, chocolatey cookies. Though I warn you that if you plan to have some for company, you might want to make two batches. They disappear quickly!! Using a large cookie scoop, Place cookies a few inches apart on a cookie sheet lined with a silpat or parchment paper. Decorate the tops with extra chips if desired. Bake for approximately 12-15 minutes making sure not to over bake. Allow to cool for a few minutes on the cookie sheet to set before removing them to a cooling rack. Let cool for several minutes and enjoy! Oh I am convinced I have tome to make these. They are perfect for the holidays. I can’t seem to find the mint chips in my grocery store. I might have to go to Target or something. they look SO good! I LOVE anything brownie, and chocolate and mint is amazing!! Thank you Heather. I think I could eat mint and chocolate all year long!!! 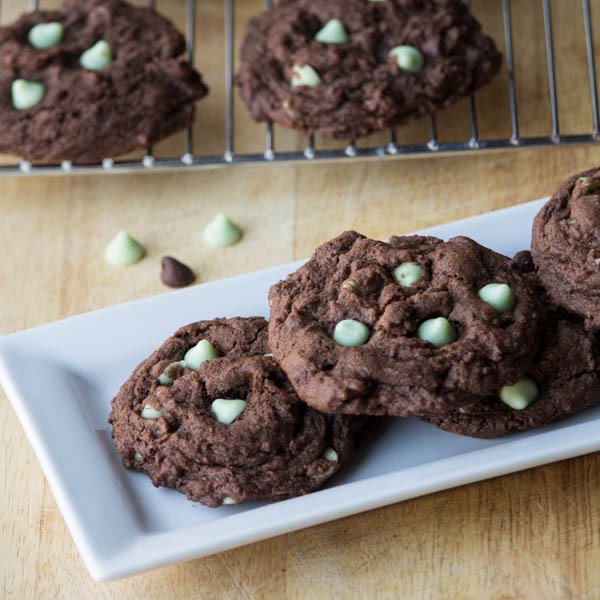 You had me at mint 🙂 Love these chocolate cookies with the mint chips peeking out!! !